Get ready for a fresh and fantastic adventure that will keep you engaged through the entire book! 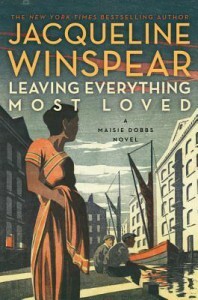 Maisie Dobbs is a woman who is not afraid to buck convention. As she and her team work through different cases, each one builds upon the other, in ways of information and reputation. When Maisie is approached about a murder that happened a few months earlier, she is eager to learn more, but dismayed to find that the police do not have much to go on. As she begins to dig into the young woman's past, she finds a picture that is disturbing. At the same time, they are trying to solve the disappearance of a young boy who is believed to have run away from home. Usha Pramal is a young Indian woman who had been working as a governess. After leaving the employ of the Allison's she took rooms at an Ayah hotel, where she began to keep houses to earn money to pay for her passage back to India. Before she can realize her dream of returning home and opening a school for young girls, she is murdered and her body found floating in a canal close to where she lived. As Maisie begins to prod into the young woman's life, she finds a few surprises along the way. But this is no open and shut case. As she begins to make headway with a few of the people who knew Usha, another young woman is killed. Maisie believes that she was killed to keep her from telling what she knew. Knowing that there is something deeper going on, Maisie and her team keep looking for answers. This book is a fantastic read! Beware that you may suffer from a book hangover, because you will be unable to set it down until you finish it! You will be drawn in from page one, but this is one adventure that you will not want to miss! Join Maisie and her team as they work to solve the murder of Usha Pramel and bring some closure to her family. Not only will you be enthralled with this delightful story, you might just learn a few new facts about a culture that many of us are unfamiliar with! Grab your favorite beverage and settle down for a delightful and enchanting book!